It feels like 2018 passed in a blur. I'm not entirely sure what we did; I just know that I'm tired. SO tired! The year started with struggles. Ophelia wasn't eating and I wasn't coping. Fortunately, solids helped her, and this success combined with some therapy helped me. She then had a succession of ear infections and stopped responding to ALL the antibiotics so ear tubes went in. Life got easier after that. We did our annual trip to Yellowstone for opening weekend, Christian's parents came out for Easter, we spent a rainy weekend at Henry's Lake, we captured and looked after a giant caterpillar (Mr Happy), and Declan went to the theater for the first time to see Joseph. Summer brought gymnastics and swimming for Declan and a new venture with the Idaho Falls Moms Blog for me. Declan also attempted to bite off half of his tongue at school one day. My parents came out for five weeks in the fall and we enjoyed two wonderful cabin trips in Challis with boat rides and in Soda Springs with fishing. C's parents came for Thanksgiving, we went back to the Soda Springs cabin, and Declan actually ate his turkey dinner at the Sandpiper! Christmas was lovely. This was the first year that Declan understood what was happening and had excitement for the big day. Both kids enjoyed their gifts and we didn't go TOO crazy after five straight days at home with the maniacs. Ophelia has grown into quite the little madam, with impressive tantrums whenever she doesn't get her way. She's a far better eater than Declan ever was, but I can see aspects of pickiness starting to emerge. She loves to look at books, dance to music, play with water (including toilet water), and cuddle. Yay for the cuddling! We're still waiting for her to have some words and getting a little worried about her lack of speech at this point, to be honest. She's still TINY and adorable, even when screaming, and takes forever to grow a tooth. I cannot believe how much Declan has grown (mentally, not physically, since he doesn't eat!). This was the year of activities for him, with gymnastics and swimming. He did really well in swimming and his confidence in the water has exploded. Gymnastics is not quite as successful. He's really strong and good at the skills, but not so great at following directions! They actually bumped us down to the mum & me class and we're still working on getting moved up again. Every time I think he's doing better, he throws a complete fit about something ridiculous. His vocabulary is astounding and he talks all the time. ALL THE TIME. Sometimes it feels like he will never stop talking, so much so that we're wondering if that's why Ophelia doesn't talk - she can't get a word in! Declan currently loves Play Doh, Paw Patrol, Darth Vader, and playing doctor/vet, and is working on his reading and writing. He knows all of the letters and can spell many simple words. His writing is definitely a work in progress. He starts well, but often gets bored before the end of a word. He also cannot decide which hand he wants to use! Teaching him tic tac toe and playing Wii have revealed that he is NOT a good loser, so we need to work on that. I'm all for being competitive and wanting to win, but you can do that and also lose gracefully. I don't have many goals for 2019. I hope that we get some things accomplished on our disaster of a house. I want to continue my work with the Idaho Falls Moms Blog and build on new friendships there. I hope we can make it to England for Christmas. I should probably maybe kind of possibly try to start exercising again if I can figure out when to squeeze that in, and I know I need to drink more water. I would like to get more sleep, but that's not in my control whatsoever. 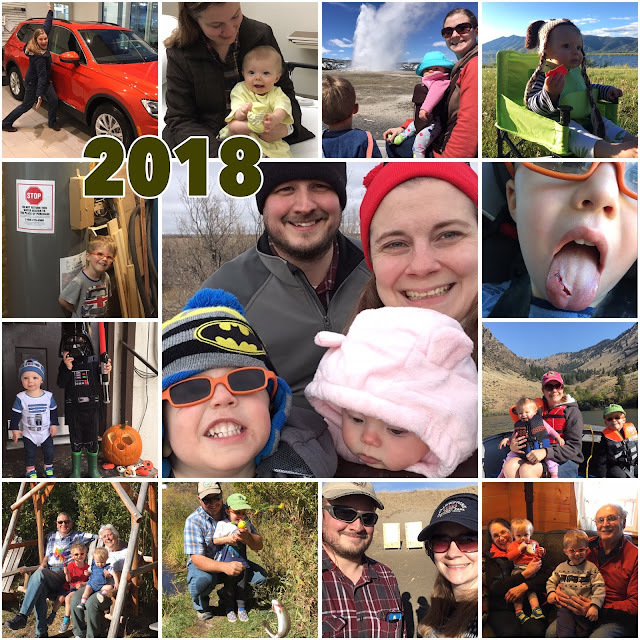 In short, 2018 was good, I'm okay with more of the same.